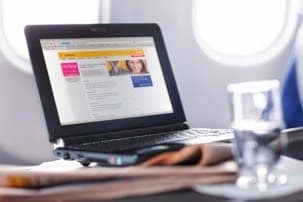 While airlines in the US have been offering Wi-Fi services on their flights for quite a while now, Australian travellers have had to wait until recently to get connected at 37,000 feet. Interested? Well keep reading, because here’s a list of airlines now offering Wi-Fi on Australian flights. Whilst Wi-Fi being available on flights is a great thing, it’s still mildly disappointing that it costs such a high amount for so little browsing. On the ground, you can use your mobile internet to stay connected with friends and other travellers, for example iiNet’s mobile broadband, but it gets ten times more frustrating in the air. Whilst short haul flights are bearable, it’s the super long routes that really see boredom levels spike and leave us wanting a bit of entertainment that can’t be satisfied by the usual inflight movies and TV shows. While the airline doesn’t offer Wi-Fi web browsing, Virgin Australia now offers a wireless in-flight entertainment service on passengers’ personal devices. Passengers who want to connect via their laptop will need to download Microsoft Silverlight, while those with their own device – such as a smartphone or tablet – need to download the special Virgin app prior to boarding, and activate it online before the flight. 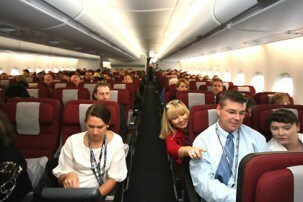 Passengers are then free to watch some 300 hours of movies, TV shows and music. 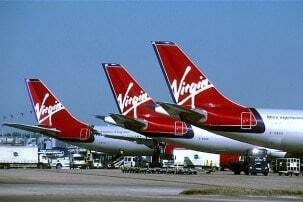 Virgin introduced the system on around 15 of its domestic aircraft last month, and hopes to have the bulk of its Boeing 737 and Embraer E190 fleet upgraded by the end of the year. Qantas recently trialled – and then scrapped – a Wi-Fi web browsing service. It was apparently scrapped because of low demand, but that could have been caused by the high cost of connection (between $12.90 and $39.90 for data packs of up to 35MB). When compared to the cost of data on the ground – on mobile broadband or fixed-line – some passengers may have thought the cost too high. Nevertheless, Qantas does plan to roll out a wireless in-flight entertainment system similar to Virgin’s later on this year. Passengers on all Emirates Airbus A380 flights (including all flights to and from Australia) can now connect their laptops and devices to the internet via wireless hotspots fitted throughout the plane. Connection costs US$7.50 (about $7) for 5MB, $15 for 25MB, or $25 for up to 100MB. Emirates’ research shows that 52% of passengers using this service do so with a smartphone, and the average data consumption is 20MB. Passengers mostly connect to social media, news and travel sites, with the most data used on day flights longer than three hours. Singapore Airlines also provides an internet Wi-Fi service on selected flights to and from Australia, with pricing ranging from US$25 ($23.90) for 30MB, to US$10 ($9.50) for 10MB. Singapore Airlines’ low-cost offshoot Scoot now offers a wireless in-flight entertainment service similar to Virgin’s – on laptops and tablets only – at a cost of $12. Etihad recently released its ‘Wi-Fly’ service on its A330-200 fleet, which flies from Brisbane to Abu Dhabi via Singapore, plus Brussels, Dublin, Manchester, Munich, Frankfurt and Milan as connections from Abu Dhabi. Larger aircraft used for Sydney and Melbourne flights will be kitted out with Wi-Fly by the end of 2014. Connection costs US$25 for 24 hours, or US$14 for one hour. United Airlines has announced a new in-flight Wi-Fi service on Boeing 747 trans-Pacific and trans-Atlantic routes, to be rolled out “soon”. Passengers will have the choice of two speeds, with ‘Standard’ costing between US$4 and US$15 depending on the length of the flight, and the ‘Accelerated’ connection ranging between US$6 and US$20. No streaming ‘til late 2014 though! Anyone out there using the Wi-Fi services on airplanes regularly?